It’s no secret that the students of the University of Oxford’s School of Geography and the Environment (SOGE) are passionate about environmental awareness. In my experience, recognizing the environmental impact of food production stands out as a significant challenge in a world where environmentally-educated individuals strive to limit their ecological footprints, and yet are also influenced by social factors to behave and eat in certain ways. As a student in SOGE, I have noticed the presence of this internal struggle amongst my peers. 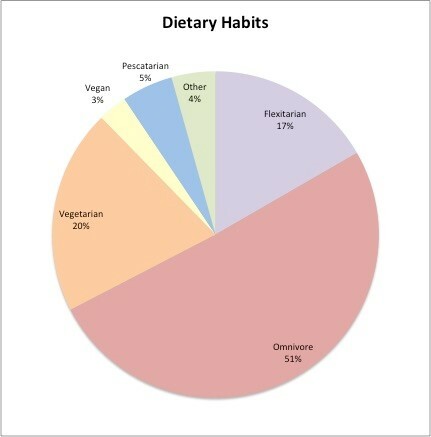 So, for an assigned essay in my Food Systems elective as part of a masters program, I decided to investigate the extent to which external factors such as cost, nutrition, and culture influence the dietary habits of the students of SOGE in an attempt to understand why the members of the school eat the way they do. The study’s primary assumption, however, is that these students possess a certain level of awareness about the impact of their dietary choices. By establishing a baseline for this assumption, I am able to look at education as one factor out of many in a behavioral approach to understanding dietary choices amongst the environmentally educated. The online survey used for the study received responses from 28% of 225 undergraduates, 24% of 145 doctoral students, and 29% of 138 master’s students, representing an overall 27% response. 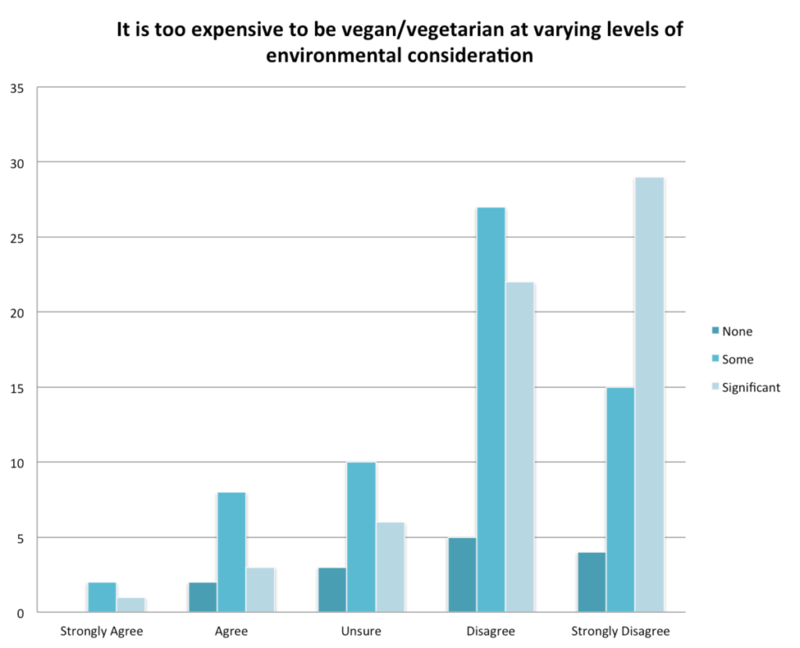 As shown in Figure 1, the responses show a clear departmental preference for lower-carbon diets with a rate of vegetarianism nearly six times the UK national average. This tells me that, at the very least, SOGE students have established a basic link between animal products and climate change. Also, the high number of flexitarians suggests that many are making an effort to shift towards a low-carbon diet. I then wanted to quiz the respondents on their understanding of carbon footprints. By asking them to rank the relative carbon footprints of different foods, I could possibly explain other trends. 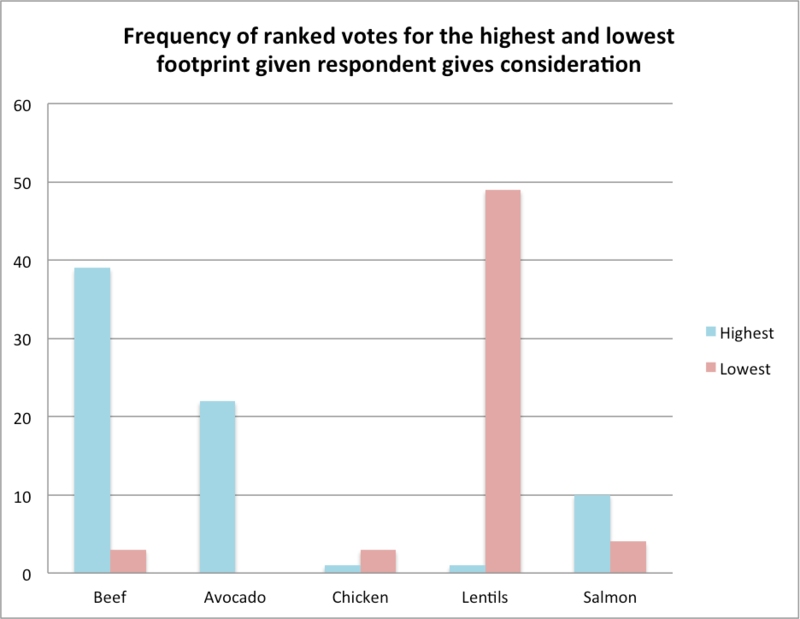 Figure 2 shows the distribution of rankings for the footprints of local beef and avocado from California. In this ranking exercise, 1 represents the highest footprint and 5 is the lowest. While beef is ranked most frequently as having the highest footprint, avocado is not far behind. What is most surprising about this figure, however, is the number of people that ranked beef as having the lowest footprint. This suggests some serious misinformation or misconception when it comes to the environmental impact of beef. Even if shipped from the other side of the world, avocado would still rank lower than just about any animal product. On the other hand, beef has one of the highest footprints of any food. Come on now, SOGE. However, another question in the survey asks students to choose whether or not they consider the carbon footprint of their foods. When I break down the same rankings based on this simple yes/no question, it becomes clear that students that do give consideration have taken more time to educate themselves on the relative impacts of different foods. 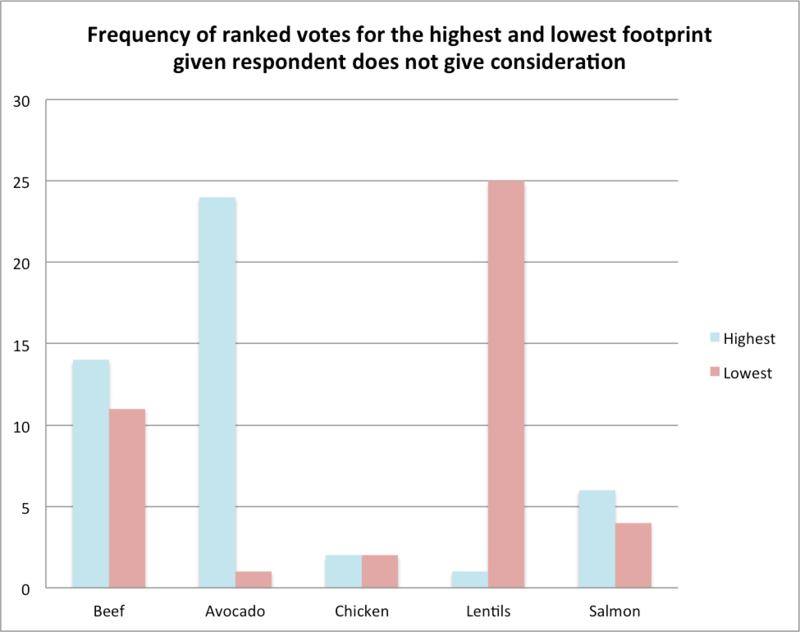 As shown in Figure 3.b, nearly all respondents that ranked beef as having the lowest footprint also marked that they do not consider the footprint of their foods. Clearly, however, individuals have different perspectives. Figures 4 (a-d) attempt to outline just what these different perspectives are. 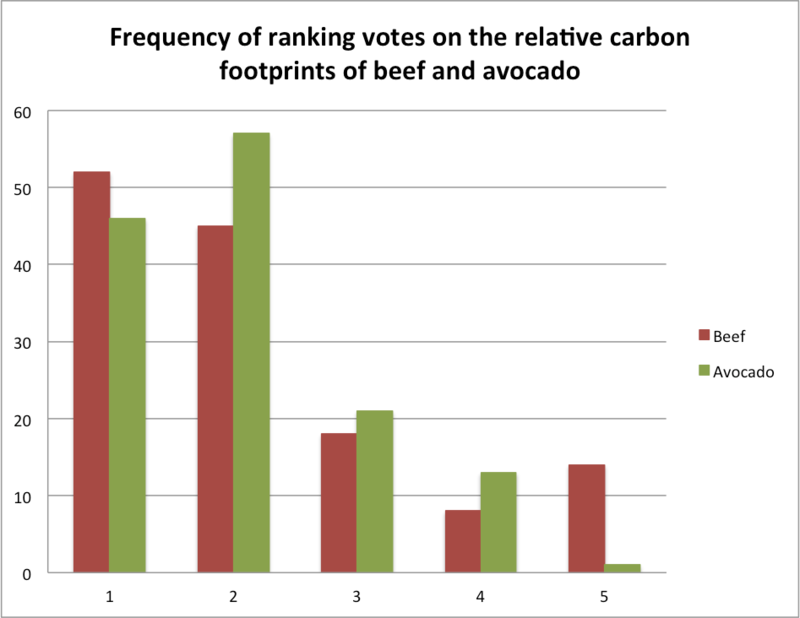 Figure 2: Chart showing the count of votes for beef (red) and avocado (green) for each ranked position from 1 (highest carbon footprint) to 5 (lowest). Figure 3 a (left), b (right): Figures show the difference in rankings differentiated by whether the individual considers the footprint of their foods (n=80) or not (n=58). Figure 4 (a-d): Figures show results of impact of the level of environmental consideration on four external drivers of dietary habits: cost (a), nutrition (b), culture (c), and the belief that individual actions can influence the environment (d). The survey also established the extent to which environmental knowledge plays in their dietary habits (none, some, significant). 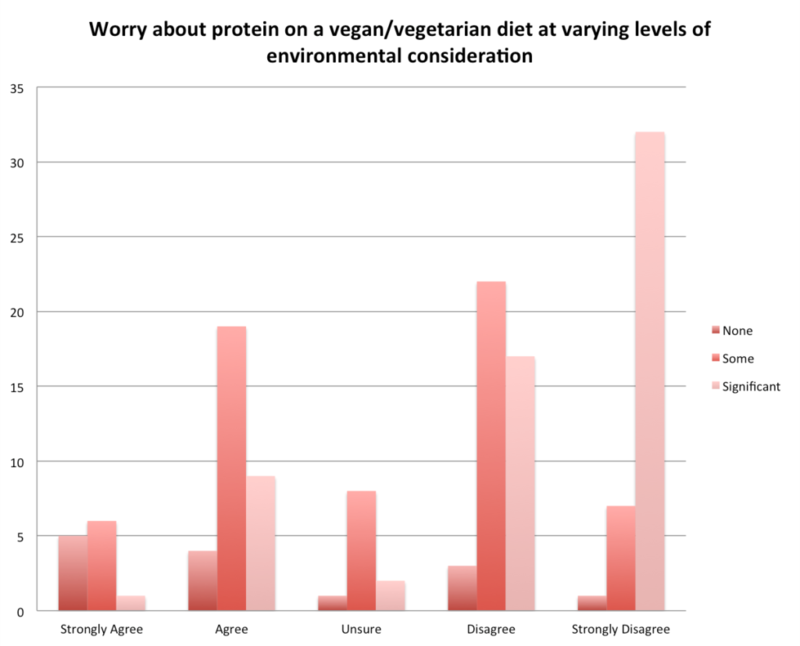 I mapped these responses against questions meant to observe trends in the impact of other factors in dietary choice. According to Figure 4a, it seems as though respondents believe a low-carbon diet would be affordable, regardless of their environmental consideration. 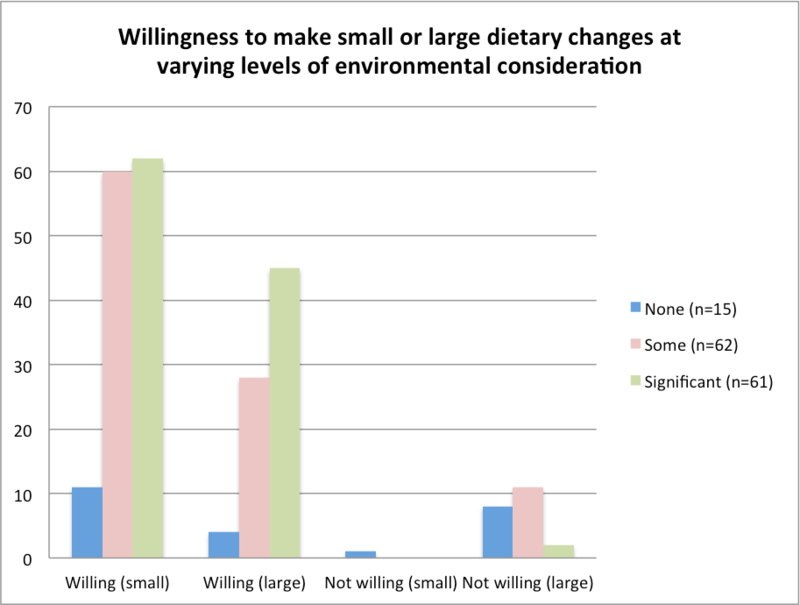 However, in Figure 4b, those that do not consider their environmental knowledge in their dietary decisions worry about the nutritional viability of a low-carbon diet. 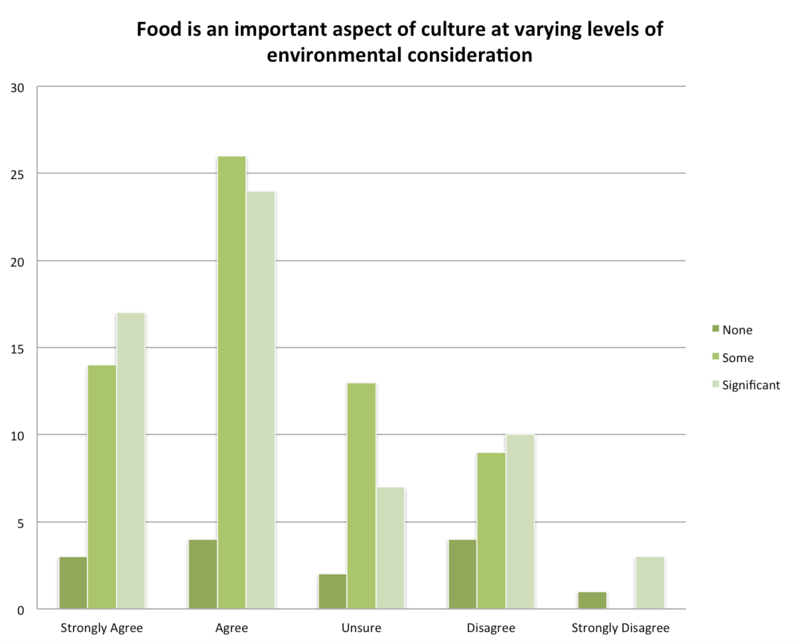 Figure 4c suggests that food is a somewhat important aspect of culture regardless of environmental consideration. The most interesting trend to emerge, in my opinion, is shown in Figure 4d. It shows that, regardless of environmental consideration, the students of SOGE have strong environmental efficacy, meaning that they believe their actions can make a difference. As agents-of-change in training, I would hope for nothing less. So, what did we learn from this little departmental exploration? I think it’s summed up quite nicely in the figure below. 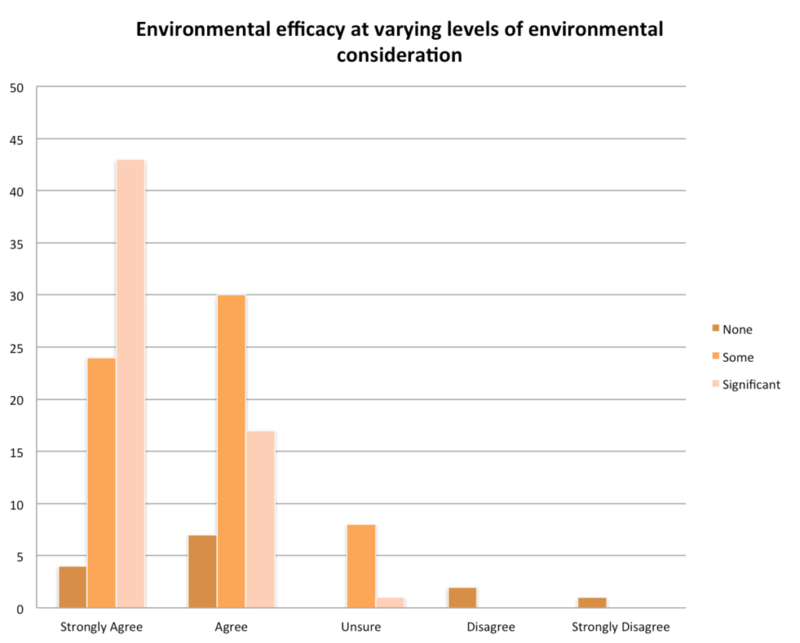 Regardless of how much students of SOGE allow their diets to be influenced by their environmental knowledge; nearly everyone is willing to make some change at some level. This tells me that the department collectively acknowledges that dietary change is important. The breakdown of results shows that, while some factors may be preventing individuals from making changes in their diet, such as lack of nutritional understanding, the willingness to change is still present. What is perhaps more important is the level of environmental efficacy driving this willingness. The belief that one’s choices matter is what makes those choices significant. “Find Out How Many Vegans Are In Great Britain.” The Vegan Society. N.p., 2016. Web. 14 Apr. 2018.